Cherry Tree Cattery has been providing care and attention to cats of all shapes and sizes for over a dozen years and over that time has developed a reputation for outstanding care and attention. We are a small family run business and we pride ourselves in the standard and care we give to all the cats who come to stay with us. We aim at all times to make their stay an enjoyable one. We do this by listening to the owners about their cat's likes and dislikes. We provide a calming and stress free environment with lots of love and cuddles. Each of our units incorporates a large indoor run with shelves and a separate heated sleeping area. We provide all the bedding, food, and litter that your cat needs but we are quite happy for you to bring any toys, beds, or blankets that you think will help your cat to settle in. 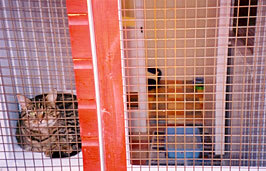 Because we are an indoor cattery all of our cats have the full run of their accommodation 24 hours a day. Unlike some catteries, we don't charge you any extra for heating or insurance while your cat is with us. We offer single, double, and family units which sleep up to four cats. We encourage new customers to view the cattery before making a booking. We will be happy to answer any questions you may have. Please contact us to arrange an appointment.